Two Lucky Pluckers at Charters on Sunday afternoon. The Crown, Lincoln Road: THE MIDAS TOUCH from 8.30pm playing funk, rock and soul covers. Free admission. The Ostrich, North Street: EMBRACE - a place for the people by the people of the LGBTQIA+ community. 9pm until 2am. The Crown, Lincoln Road: THE ELECTRIC WARRIORS. The legendary Peterborough 70s’ rock covers band from 9pm.Free Admission. Blue Bell, Werrington: Iron Fist. Peterborough Conservative Club: Afternoon tea dance with Eric Cloud; then spend the evening with the amazing TREVOR LEESON. The Peterborough Parkway sports & Social Club, Maskew Avenue: Parkway Live: W45/ Filthy Contact. Doors open 7pm. The Met Lounge: Open Mic Night. 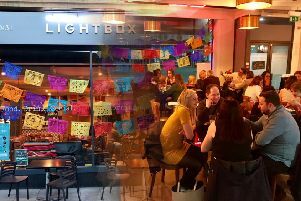 The Lightbox, Bridge Street: High energy, foot stomping, hand clapping music from the generation that taught us to party. Welcome to Loaded. Join Nathan & Martin as they take you through the sounds that defined the 90s. Prince Of Wales Feathers, Castor: Stealer. The Crown, Lincoln Road: LOST AND SOUND from 9pm playing pop, rock, rock ‘n’ roll and dance covers. Free admission. Yard of Ale, Oundle Road, Woodston: 3rd Stone From The Sun. Three Horseshoes, Werrington: The Deps, from 8pm. The Bull, Newborough : Division, from 8.30pm. The Burghley Club, Burghley Road: The Sound Injectors, free entry. Charters, Town Bridge: The Lazoons (pictured) - 4-piece covers band who will entertain you with a selection of hits from across the decades from 10.30pm, free entry. Peterborough Conservative Club: Enjoy the wonderful sounds of SPLASH. The Peterborough Parkway sports & Social Club, Maskew Avenue: Dale Diamond. The Lightbox, Bridge Street: Icons of Gay Night. The music, the fashion, the movement that changed world. Celebrating the under ground New York clubs of 1970s. Be loud, be proud and get down. Free entry. Brewery Tap: The Get Down with Resident DJ Eddie Nash 9pm – late, free entry. The Peterborough Parkway sports & Social Club, Maskew Avenue: Richard Keeling. The Met Lounge, Bridge Street: Ten Years Dead, Graves and Call to The Faithful.